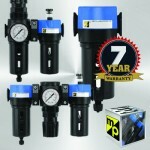 UK fluid power distributor TOM PARKER LTD has announced an expansion to its range of filters, regulators and lubricators (FRL) from Master Pneumatic Inc. (MP) who began life as a parts supplier to the automotive industry. Over the last 50 years MP has expanded its product range into other markets and applications and has evolved into a global manufacturer and distributor with over 700 custom products to support its wide range of customers. The product range is now used in a wide assortment of markets including construction, food, beverage and medical. MP says its knowledge and attention to detail is well demonstrated with the introduction of its latest range of intermediate sized multi-purpose FRL’s for compressed air; brought to the UK fluid power market exclusively by Tom Parker Ltd.